After several good days of weather and progress at the High Pasture excavation, we have experienced a return to winter conditions, with strong winds, hail and heavy rain! The heavy showers of rain and strong winds have hindered progress at the High Pastures site over the last couple of days (5th & 6th April). 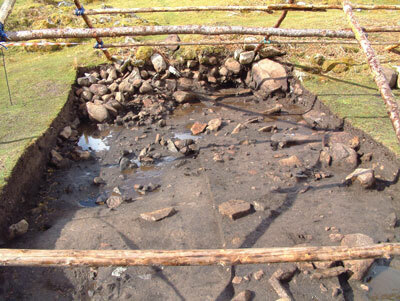 Pools of water in Trench 2 has resulted in no excavation and the unsettled weather is set to continue into the weekend. However, excellent progress was made on site between the 30th March and the 4th April, the excavation and recording of Trench 2 progressed well and although finds from the excavation were few and far between, some interesting features were uncovered. Figure 1. 6th April - the sun was shining when this image was taken today, but heavy rain has resulted in pools of water forming in Trench 2. Progress also means we are heading closer to our main objective in this trench - to reveal the original entrance into High Pasture Cave and Bone Passage, where our trial excavations in 2004 produced a wide range of archaeological finds. Figure 2. Trench 2 from the NW. Notice the dark-coloured sediment in the right-hand half of the trench, which comprises the fill of the original entrance shaft at this level. 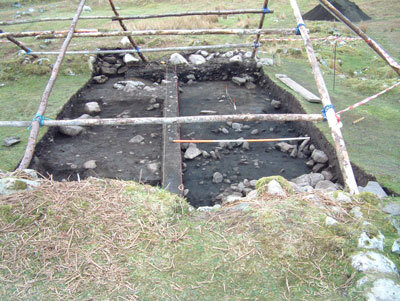 The left-hand section is still under excavation, where we are just starting to reveal the organic rich matrix. We have come down onto a more ‘natural’ buff-coloured sediment at the SE end of the trench, which has charcoal and burnt bone fragments within the surface layer. This surface is quite uneven with scoops and pit-like features marking its surface, some of which are filled with fire-cracked stone, pebbles and charcoal lumps. These seem to be discrete ‘dumps’ of material, possibly from nearby fire settings. One such setting was found in the N side of Trench 2, where a large horizontal slab of granite seems to have had a fire set on it. The granite had been so affected by the heat, fracture lines have run through the stone and has made it very friable. Figure 3. 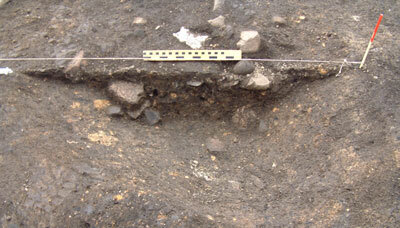 One of the pit features cut into the buff-coloured sediment, containing fire-cracked stone and charcoal. An investigation of the granite cobble wall at the SE end of Trench 2 has shown that it is founded on the buff-coloured sediment, and the layers of fire-cracked stone were found to run up against it on the inside face. However, this does not seem to be the case at the moment in the NW end of the trench where the fire-cracked material seems to be running under the granite wall, although this requires further clarification. A small area of paving was uncovered by Martin running under the tumbled wall, while George recovered several pebble hammers and grinders, and a larger piece of worked stone (granite) that may have been used as a quern stone and a hammer! Other finds from the trench include small fragments of pottery and metalworking slag. The edge of a ‘cut’ feature is showing in the centre of Trench 2, where the buff-coloured sediment dips sharply into a dark, organic-rich matrix that has significant quantities of fire-cracked stone in it. At the NW corner of this cut feature, slab-like stones can be seen in the dark sediment, which are all dipping at a similar angle - down and inwards into the cut feature. This may be caused by slumping of material in the former entrance, indicating that we may be getting closer to our goal! Hopefully, the water in the trench will dry up and allow us to proceed with the excavation. Visit the News Page again soon to see what we find. What a good site, can’t wait for work to restart. M.